Difference between revisions of "Hudson"
Hudson is a continuous integration (CI) tool. The [http://eclipse.org/hudson/ Hudson project] is hosted at Eclipse.org, and is in use on Eclipse servers for Eclipse projects as part of the [[CBI|Common Build Infrastrure (CBI)]]. This page is about the hosted service at Eclipse.org. For more information on the project itself, or to download Hudson, please see the [http://eclipse.org/hudson/ Hudson project] page. The Eclipse Foundation runs a Hudson continuous integration server that eclipse hosted projects can take advantage of for their builds.&nbsp; Currently this is hosted here: https://build.eclipse.org/hudson, but due to stability issues a new 'stable' instance has been created and is hosted here: https://hudson.eclipse.org/hudson . The Hudson server allows for the execution of Continuous Integration Builds, Nightly Builds, Integration Builds, Release Builds, and Testing. 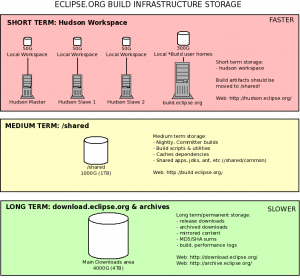 The 'stable' Hudson instance is maintained by the Eclipse Webmasters. The planned Hudson sandbox instance will be maintained by the eclipse community. Job creation will be limited to committers and admin rights are administered by the community as a whole. If you have a build that is currently running on the 'unstable' Hudson instance(hosted on https://build.eclipse.org/hudson) and you wish to move to the Hudson instance managed by the Foundation(hosted on https://hudson.eclipse.org/hudson) you will need to file a bug against community->hudson with a subject like 'Move job job-name to hudson.eclipse.org'. Webmaster will then import the job and close the bug. Please note that the stable instance does not provide the same plugins as the unstable instance. You may also need to update your job configuration to account for differences in the Hudson deployment. * Need help actually building your code: ask your project mentors, or ask on the Common Build mailing list (cbi-dev). There are no dumb questions. Presently the 'new' hudson setup uses 3 SLES 11 x86_64 machines (1 master and 2 slaves), with bash as the default shell. These machines are behind a firewall so any outbound http(s) connections are proxied. HIPP (Hudson Instance Per Project) instances are recommended for those projects who prefer flexibility and convenience with their CI system, perhaps at the expense of security and webmaster support. A single Linux master is provided, and the instance is run under the security context of your project. Optionally, a project's Hudson instance can be configured to write into a project's downloads area and can be given write access to the code repository for automatic tagging of builds. This does create a security risk - see https://bugs.eclipse.org/bugs/show_bug.cgi?id=375350#c42 for a fix. Webmasters will install most plugins you request, including the Gerrit plugin, but will offer little support. In time, projects will be offered self-serve restarts and re-imaging of their instances. Please file [https://bugs.eclipse.org/bugs/enter_bug.cgi?product=Community&component=Hudson a bug] against Eclipse Foundation > Community > Hudson to request your project's own instance. Please ensure your project lead can +1 the request. Please specify if you would like to use the Gerrit Trigger plugin, and if you wish to grant write access to your download or code repositories. HIPP slaves are only provisioned for those projects who have a need. To request a HIPP slave, please [https://bugs.eclipse.org/bugs/enter_bug.cgi?product=Community&component=Hudson&short_desc=HIPP%20slave%20needed%20for%20my%20project file a bug]. You can also [[Hudson/Connecting HIPP to an external slave | connect to your own external slave]]. * '''hudson-slave1, hudson-slave2, hudson-slave4''' - these are the main build nodes for Hudson jobs. You can specify them by name or by using the 'build2' label. * '''fastlane''' - this slave is intended for usage during a release train crunch when re-spins may require more capacity than hudson-slave1&amp;2 can provide. By default jobs should not run here. * '''mac-tests and windows7tests''' - these 2 slaves are meant for running UI tests for their respective OS versions. By default jobs should not run on either slave. [[Image:Build infra layout.png|thumb|Build and Hudson storage layout]] Three tiers of storage are available for storing Workspaces, build artifacts, nightly and release builds. For optimal build performance and service availability, it is important that you use each storage device according to its intended purpose. But I saw that the CDO build is green again and they still do an Ant call from Hudson that again triggers Buckminster. Previously that build failed with the same exception as ours did or do. Be sure to request your HIPP instance to actually have write access to these locations. If there is a problem, file a bug against [https://bugs.eclipse.org/bugs/enter_bug.cgi?product=Community Eclipse Foundation > Community > Servers]. See [[Milestone and Release Builds]]. Since April 2017 the proxy is no longer required to access the internet from HIPP instances. *[[Common Build Infrastructure/Getting Started/Build In Hudson|Build in Hudson]] - Information on requesting jobs, running jobs, setting up builds. If using the Promoted Builds plugin with a Promotion Criterion of "Only when manually approved", you can also use "role" groups (using the aforementioned "ROLE_" syntax). In fact, you *should* at least restrict the approvers to the group of project committers, as otherwise any anonymous can run a promotion job ([https://bugs.eclipse.org/bugs/show_bug.cgi?id=424619 Bug 424619]). Please add other known administrators. *How do I use the Test Slave Node to run Tests? Please file a bug against Eclipse Foundation > Community > Hudson to request your project's own instance. Please ensure your project lead can +1 the request. Please specify if you would like to use the Gerrit Trigger plugin, and if you wish to grant write access to your download or code repositories. If your git repo is handled by gerrit, granting write access to your code repositories is a different procedure, so you must ask specifically for it. If you don't use Gerrit, then granting write access to your download area automatically grants write access to your code repositories and vice-versa. There may be security issues related to using the Gerrit plugin and there may be security issues related to allowing the CI system to write directly to your code repos and downloads area. If you request plugins other than those available on the Shared instance, webmaster may not be able to help troubleshoot any issues that you may encounter with your instance. Since the Hudson project became dormant, as of 2017 no more HIPPs will be provisioned. Instead JIPPs (Jenkins Instance Per Project) will be provisioned..
HIPP slaves are only provisioned for those projects who have a need. To request a HIPP slave, please file a bug. You can also connect to your own external slave. hudson-slave1, hudson-slave2, hudson-slave4 - these are the main build nodes for Hudson jobs. You can specify them by name or by using the 'build2' label. Be sure to request your HIPP instance to actually have write access to these locations. If there is a problem, file a bug against Eclipse Foundation > Community > Servers. See Milestone and Release Builds. If using the Promoted Builds plugin with a Promotion Criterion of "Only when manually approved", you can also use "role" groups (using the aforementioned "ROLE_" syntax). In fact, you *should* at least restrict the approvers to the group of project committers, as otherwise any anonymous can run a promotion job (Bug 424619). This page was last modified 08:12, 31 August 2017 by Frederic Gurr. Based on work by Markus Keller, Christopher Hylands and Christoph Schulze and others.